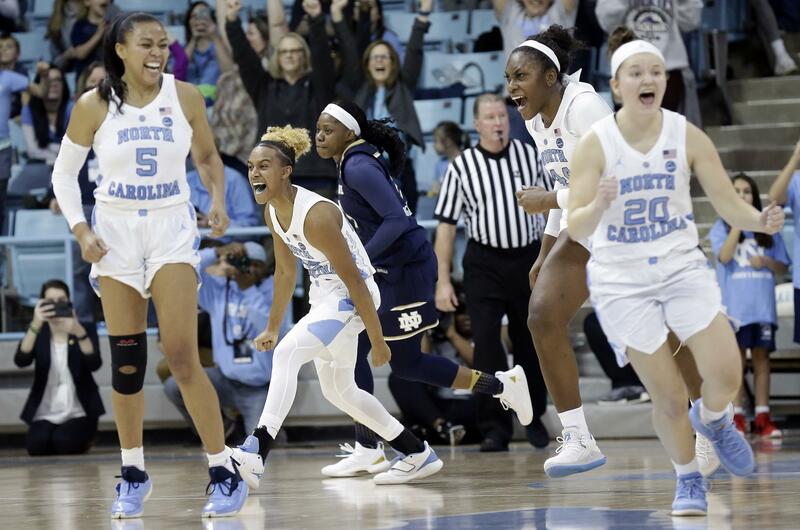 Leah Church came through with a 3-pointer at the 1:25 mark for her only basket, which broke a 71-all tie to put the Tar Heels (12-9, 3-4 Atlantic Coast Conference) ahead for good on the way to a major upset. UNC led by 10 early in the fourth quarter before Notre Dame ran off 12 straight points to take the lead. But instead of crumpling, the Tar Heels found a counterpunch. Marina Mabrey had 20 points to lead the Fighting Irish (19-2, 6-1), who were missing star Jackie Young with a sprained right ankle. No. 2 BAYLOR 74, OKLAHOMA 53: Juicy Landrum scored 21 points, Kalani Brown added 20 and Baylor extended its Big 12 Conference winning streak to 30 games, rolling past Oklahoma in Norman, Oklahoma. Chloe Jackson added 10 points and Lauren Cox had seven points and 12 rebounds for Baylor (17-1, 7-0 Big 12), which could move into the top spot in the AP Top 25 on Monday, since current No. 1 Notre Dame lost Sunday at North Carolina. Baylor also has won 30 straight road games against Big 12 teams. Oklahoma (5-13, 1-6) has lost six straight games, the worst losing streak for the Sooners in more than two decades. No. 3 UCONN 93, UCF 57: Napheesa Collier led a balanced attack with 23 points, and UConn routed UCF in Hartford, Connecticut, to move into sole possession of first place in the American Athletic Conference. Collier, Megan Walker (21 points), Crystal Dangerfield (17) and Katie Lou Samuelson (15) were all in double figures before halftime for the Huskies (18-1, 7-0). Collier added nine rebounds and needs just two boards and 37 more points to become the fifth UConn player with 2,000 points and 1,000 rebounds. Kayla Thigpen had 14 points to lead UCF (17-3, 6-1). No. 4 LOUISVILLE 70, PITTSBURGH 42: Dana Evans scored 16 points to guide a short-handed Louisville squad to a victory over visiting Pittsburgh. The Cardinals (19-1, 7-1 Atlantic Coast Conference) played without senior guard Asia Durr, who was a late scratch for undisclosed reasons. Louisville didn’t need the services of the conference’s second-leading scorer thanks to an 18-2 first quarter run that put the game well out of reach. The Panthers (9-12, 0-7) made their first shot 51 seconds into the game to take the initial lead. However, Pitt then proceeded to miss its next 16 shots. By the time Kauai Bradley hit a 3-pointer for the Panthers with 3:36 left in the first half, Louisville held a 39-9 lead. No. 5 OREGON 76, WASHINGTON 57: Erin Boley scored a career-high 31 points, hitting nine 3-pointers, to Oregon to a victory over Washington in Seattle. Oregon (19-1, 8-0) has won 12 consecutive games and is the only team left with an unbeaten conference record in the Pac-12. It’s the best conference start ever for the Ducks. No. 6 Stanford suffered its first Pac-12 loss Sunday at Utah. Washington (8-13, 1-8) lost in fifth straight game. Sophomore guard Missy Peterson led the Huskies with 13 points. No. 21 UTAH 75, No. 6 STANFORD 68: Erika Bean scored 23 points and a hit a go-ahead 3-pointer with a minute left to lift Utah over Stanford in Salt Lake City. Megan Huff had 17 points and 12 rebounds for Utah, and Kianna Moore added 13 points. The Utes (18-1, 7-1 Pac-12) won their sixth straight. Alanna Smith had 19 points and seven rebounds before fouling out with 50 seconds left for Stanford (17-2, 7-1). Dijonai Carrington scored 13 points, and the Cardinal shot just 25 of 65 (.385) from the field. No. 7 MISSISSIPPI STATE 80, MISSISSIPPI 49: Teaira McCowan had a season-high 33 points with 13 rebounds, and Mississippi State beat visiting Mississippi for the 10th straight time. McCowan’s barrage followed a poor performance on the road at Florida on Thursday when she managed just two points. The preseason Southeastern Conference Player of the Year has won SEC Player of the Week the last two weeks and four times this season. Mississippi State’s post presence was a burden for the Rebels. Senior forward Anriel Howard added 16 points and 11 rebounds. The Bulldogs (19-1, 7-0 SEC) had a 42-14 advantage on points in the paint and outrebounded the Rebels 43-27. For the Rebels (8-13, 2-5), Crystal Allen had 15 points. No. 8 N.C. STATE 68, GEORGIA TECH 60: Elissa Cunane scored 17 points, Kiara Leslie added 16 points and North Carolina State remained the nation’s lone unbeaten team in Division I with a victory over Georgia Tech in Atlanta. The Wolfpack (20-0, 6-0 Atlantic Coast Conference), a Sweet 16 team last season, are off to the best start in program history and their best ACC start in 30 years. They overcame 18 turnovers, most of them forced by Georgia Tech’s press, to beat a team that was 8-1 at home and off an upset win over No. 12 Syracuse. N.C. State moved into sole possession of first place in the ACC following No. 1 Notre Dame’s loss at North Carolina. No. 9 OREGON STATE 52, WASHINGTON STATE 35: Mikayla Pivec had 19 points and nine rebounds, and visiting Oregon State beat Washington State for its ninth win in 10 games. Destiny Slocum scored nine points for Oregon State (17-3, 7-1 Pac-12), which has won its past 11 games against Washington State. Chanelle Molina scored 12 for Washington State (7-13, 2-7), which lost its fourth straight. No. 10 MARQUETTE 87, BUTLER 58: Natisha Hiedeman scored 21 points and Marquette cruised to a victory over Butler in Indianapolis. The Golden Eagles took a 36-31 lead into the half after Butler fought its way back to make things interesting. But the Golden Eagles outscored the Bulldogs 30-13 in the third quarter to take a commanding 66-44 lead into the final period. Amani Wilborn finished with 13 points and Allazia Blockton scored 16 points for Marquette (18-3, 9-0 Big East). Butler trailed 14-4 early, but managed to outscore Marquette 25-15 over a 10-minute stretch of basketball that tied the game at 29 in the second quarter. Kristen Spolyar led Butler (16-4, 9-2) with 13 points. No. 11 MARYLAND 76, INDIANA 56: Kaila Charles scored a season-high 25 points with 11 rebounds and Maryland rolled past Indiana in Bloomington, Indiana. Stephanie Jones scored 20 points for the second straight game and Taylor Mikesell added 13 points and five assists for the Terrapins (18-2, 7-2 Big Ten), who won their third straight. Jaelynn Penn scored 15 points and Bendu Yeaney had 10 for Indiana (16-5, 5-4). No. 13 SYRACUSE 64, DUKE 55: Kiara Lewis came off the bench to score 20 points, setting a career high for a second straight game, and Syracuse defeated Duke n Durham, North Carolina. No. 14 RUTGERS 69, PENN STATE 61: Stasha Carey scored 19 points, Tekia Mack made back-to-back 3-point plays down the stretch and Rutgers turned back Penn State in University Park, Pennsylvania. No. 24 TEXAS A&M 73, No. 15 KENTUCKY 71: Chennedy Carter and Kayla Wells each scored 20 points and Texas A&M held off Kentucky in College Station, Texas. Wells made a pair of free throws with five minutes left to give the Aggies (16-4, 5-2 Southeastern Conference) a 10-point lead before Kentucky’s Maci Morris got hot. She made two 3-pointers and a pair of jump shots in a little more than two minutes cutting the deficit to 72-67. KeKe McKinney made a layup with 1:40 left after Carter missed a 3, but Kentucky failed to score again from the field. Kentucky (17-4, 4-3) got within 72-71 when Rhyne Howard made 2 of 3 foul shots with nine seconds to go after Wells fouled her on a 3-point attempt. N’dea Jones made 1 of 2 for A&M with eight seconds left before Howard missed an off-balance jumper with two seconds remaining. Morris led Kentucky with 22 points and Howard scored 21 as the two combined to make nine of Kentucky’s 11 3s. No. 16 ARIZONA STATE 68, SOUTHERN CAL 59: Kianna Ibis led a balanced attack with 11 points, leaving her one point shy of 1,000 for her career, and Arizona State defeated Southern California in Tempe, Arizona. Courtney Ekmark also scored 11 for the Sun Devils (14-6, 5-4), who had 10 of 11 players score. The only two players who played less than 10 minutes, Jayde Van Hyfte and Jamie Ruden, both had seven points in seven minutes. Mariya Moore had 19 points for the Trojans (11-8, 1-7). No. 17 IOWA 72, PURDUE 58: Megan Gustafson scored 25 points, Hannah Stewart added 21 and Iowa used a 10-2 game-ending run to pull away from Purdue in Iowa City, Iowa. The victory was the sixth in a row for Iowa (16-4, 7-2 Big Ten) as the Hawkeyes improved to 11-0 at home and avenged a 62-57 loss at Purdue on Jan. 10. Leading by five with two minutes to go, Stewart scored to lead off the final surge, including four free throws from Gustafson. Gustafson grabbed 11 rebounds in posting her 19th double-double this season. Stewart was 10 of 12 with seven boards. The Hawkeyes shot 53 percent, outscoring the Boilermakers 46-20 in the paint. Dominique Oden scored 17 points, Karissa McLaughlin 16 with four 3-pointers and Ae’Rianna Harris 12 for Purdue (15-7, 6-3). No. 22 FLORIDA STATE 56, VIRGINIA TECH 54: Nausia Woolfolk scored a career-high 27 points, including two free throws with 22.2 seconds left that gave Florida State its first lead in a victory over Virginia Tech in Blacksburg, Virginia. With 40.2 seconds remaining and Virginia Tech (13-7, 0-7 ACC) in possession with a 54-51 lead, the Hokies’ Taylor Emery was fouled but simultaneously called for unsportsmanlike contact when Morgan Jones was struck in the throat by an elbow. Emery missed both of her free throws but Nicki Ekhomu made two for FSU (17-3, 5-2), which kept possession leading to Woolfolk’s go-ahead free throws. The Hokies missed their final three shots. No. 23 MICHIGAN STATE 77, MICHIGAN 73: Taryn McCutcheon had 14 points to help Michigan State hold off Michigan in Ann Arbor, Michigan. No. 25 MISSOURI 74, AUBURN 65: Sophie Cunningham scored 30 points – 21 in the first half – and Missouri blitzed Auburn early then hold on to win in Columbia, Missouri. Cunningham scored 13 of Missouri’s first 18 points as it built an 18-0 lead. Cunningham made her first four shot attempts with three coming from behind the 3-point arc. Missouri (16-6, 5-3 SEC) didn’t score until Janiah McKay’s layup with 1:32 before the end of the first. Missouri led 23-2 at the end of one as Auburn shot 1 of 14 from the field. Missouri finished with a 17-5 rebounding advantage at the end of one. McKay led Auburn (15-5, 3-4) with 23 points. Published: Jan. 27, 2019, 5 p.m. Updated: Jan. 27, 2019, 5:16 p.m.